Amazon Echo vs Dot vs Tap: Which Smart Speaker Is Best? While Google and Apple—among other tech companies—duke it out in the realm of home automation and interconnectivity, Amazon has seemingly swept in under the radar with its own not-so-covert operation to connect your home. With the Echo, Echo Dot, and Tap, Amazon gives you the choice of three smart speakers that do pretty much the same thing with very subtle differences. Each can act as a digital assistant, play music, or help you control your smart home devices to varying degrees. I’ll give you the rundown on all three so you can decide which smart device speaks to you. Echo does everything. 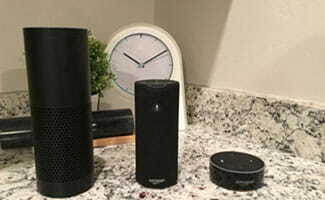 It serves as a voice-activated digital assistant, letting you set calendar events, control smart home devices like light switches and plugs, and even play music through its impressive built-in 360-degree speaker that has a 2.5-inch woofer and 2.0-inch tweeter and can easily fill the room with quality sound. At 9 inches tall, Echo sticks out and is hard to miss, but it comes in either a white or matte black finish so you can match it with your home decor and try to blend it in. 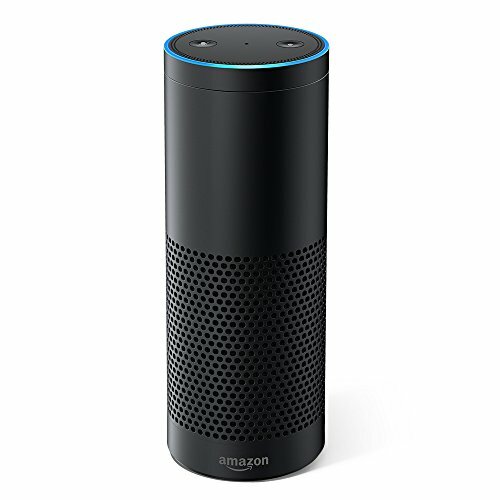 According to Amazon, the Echo and the Echo Dot are the same thing, with the built-in speaker being the only difference. In my experience, there was a noticeable difference in usability between the two. Echo captured my voice commands better than Echo Dot—and Tap—and I didn’t have to repeat myself nearly as often. You’ll already feel like you’re repeating yourself using the trigger word, “Alexa”, every time you interact with your Echo, so it becomes doubly annoying when Alexa doesn’t capture your command. As Amazon’s flagship in-home device, Echo brings the most complete package with all the capabilities of the others and a smoother user experience. Echo is my pick for the best of Amazon’s three options. Warranty: One-year limited warranty included with optional extended warranties for two or three years. Echo Dot really is the Echo’s “mini me” without the high-quality built-in speaker. It’s roughly the size of a hockey puck and does include a basic speaker for voice feedback, but it’s not a device you’ll want to use for music without connecting it to a bluetooth speaker. Echo Dot does everything the larger Echo will do. In fact, I had them connected at the same time to the same network, and although they don’t communicate with each other, either one can control your home automation devices connected to your network. You’ll want Echo Dot if you’re looking for an in-home digital assistant on a budget or already have an audio system capable of connecting via bluetooth and don’t need the built-in speaker that Echo provides. Bluetooth: A2DP (Hands-free voice control not supported for Mac OS X devices) Does not support Bluetooth speakers requiring PIN codes. Warranty: 90-day limited warranty included with optional extended warranties for two or three years. 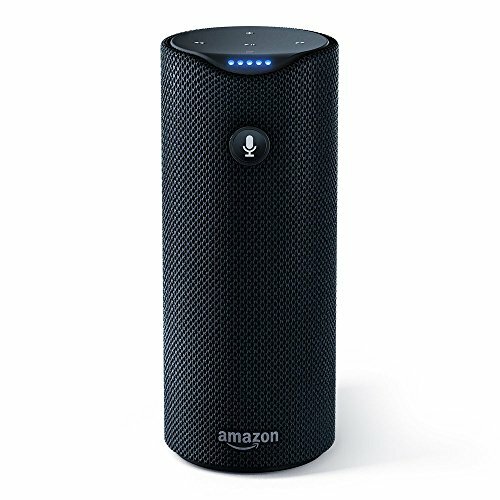 If you’re looking for a voice activated digital assistant, don’t waste your time with Amazon Tap. It’s called the Tap because you have to physically tap it to wake it up, eliminating the voice-activated convenience that Amazon’s Echo line provides in the first place. Because it’s Alexa-enabled it can still perform all of the same tasks as Echo and Echo Dot, but if I have to get up off the couch to tap a button, I might as well just pull out my smartphone. The Tap is meant to be a speaker, and as a speaker it rocks, with 360-degree sound that easily fills the room with surprising clarity. It only weighs 3.8 ounces, so it’s easy to throw in your bag and head to the beach for the day. If you’re looking for a portable bluetooth speaker first, you might consider Amazon Tap for its bonus Alexa capabilities, but for a serious digital home assistant—with voice activation—you’re better off with the Echo or Echo Dot. Warranty: One-year included with optional extended warranties for two or three years. Overall, Alexa is a great tool but ultimately suffers from the “platform war problem” that plagues the tech industry as a whole. That’s the thing where competing brands don’t work with one another: No iBooks on your Kindle or iCloud access on your Android device—you get the idea. In this case, Alexa is limited to what Amazon allows on its platform, so if you’re a Google Play Music user, you’re out of luck. That’s not to say Alexa doesn’t shine in her own right. I’ll take you through some of my main uses for Alexa so you can see how she performs as a digital assistant, music player, and home automation hub. Alexa holds her own against the competition as a digital assistant. You can add notes to your calendar, check movie times, find weather forecasts, or even get sports scores. She’s as consistent as Siri and has the added integration of home automation devices like smart plugs, smart switches, and smart bulbs that can work through the Alexa app or voice control. Alexa found the information I wanted, but only after I reframed how I asked. It gets a little monotonous repeating “Alexa, this”, “Alexa, that”, for every single back-and-forth, but after a while it becomes second nature. Expect some growing pains as you learn how to effectively communicate with your Alexa device. Listening to music presented a challenge for me because I use iTunes for my main music library. Alexa connects to Amazon Music, Pandora, and Spotify (premium), so if you use any of these music platforms you’re good to go, but not if you use iTunes, Google Play Music, or another unsupported platform. There are workarounds, however. You can connect your smartphone to your Tap or Echo via bluetooth and use your Amazon device as a speaker, but it’s an extra step and is inconvenient. If music is important to you, I recommend either switching to a platform that’s compatible with your Amazon device or finding another digital assistant that’s compatible with your platform of choice. Alexa’s home automation integration easily tops my favorite features that Amazon’s Echo line provides. It did take me a little over an hour to get everything working smoothly, mostly because you have to set up each add-on device separately through its own mobile app and then pair it with your Echo device through the Alexa app. It was kind of a tedious process, but the end result was totally worth it. Once everything was installed and connected, I was very impressed with how easy the Amazon Echo and Echo Dot made it for me to control my home by giving verbal commands like, “Alexa, turn on the entryway.” If you’re looking for a DIY home automation solution without any monthly service fees you should definitely consider an Amazon Echo device. 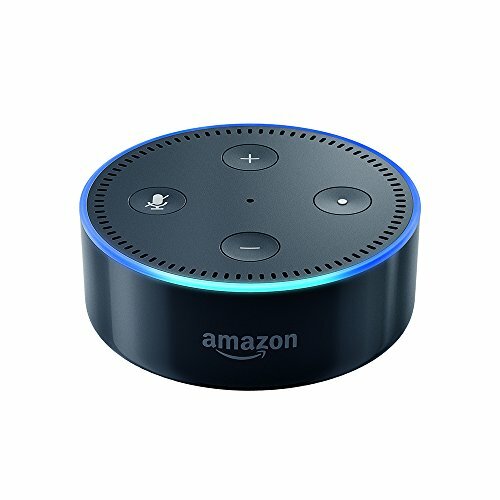 So, which Echo device should I choose? For me, it’s all about the Echo. Even though you’re going to spend more, it has the total package and provides a smoother user experience where you won’t have to repeat yourself quite as often. If you’re looking for something more budget-friendly or already have an audio system to connect to, then the Echo Dot is the way to go. But please, don’t buy the Amazon Tap thinking that it’s a digital assistant. Only go for that if you’re looking for a quality portable bluetooth speaker with a little something extra.